Download "HUD INSURED LOANS for ACQUISITION or REFINANCE of EXISTING OCCUPIED RENTAL APARTMENTS Section 223(f) and 202/223(f)"
2 Acquisition or Refinance of Existing Occupied Apartments: 223(f) Page 2 of 5 QUALIFYING PROPERTY Rental property of five or more units, at least 3 years from the date of the last C of O. Repairs cannot exceed the replacement of one system or cost more than the greater of $6,500 times the high cost factor or 15% of after-repair value. Affordable transactions must meet the criteria for Low Income Housing Tax Credit (LIHTC) properties (20% of the units with rents set at 50% of AMI or 40% of the units with rents set at 60% of AMI) and have a recorded regulatory agreement enforcing the affordability restriction by a governmental agency for 15 years. The transaction need not have tax credits if it meets the LIHTC standards. Maximum allowable commercial space and income: 20% of total net rentable area and 20% of effective gross income. LOAN AMOUNT Acquisition, the loan will be sized as the least of: Program percentage value after repairs, or Program percentage of the sum of the cost of acquisition, repairs, reserves for replacement, soft costs, and fees, or Program percentage of NOI divided by the current debt service factor, or The sum of 100% of the statutory unit cost limit adjusted by the local high cost factor, the Program percentage of the cost of improvements not attributable to dwelling use, and 100% of land value. Refinance, the loan will be sized as the least of: Program percentage of value after repairs or Program percentage of the sum of the cost outstanding debt, repairs, reserves for replacement, soft costs, and fees, or The greater of 100% of the costs or 80% of value to take cash out, or Program percentage of the estimated NOI divided by current debt service factor, or The sum of 100% of the statutory unit cost limit adjusted by the local high cost factor, the Program percentage of the cost of improvements not attributable to dwelling use, and 100% of land value. LOAN TERM The lesser of 35 years or 75% of the remaining economic life of the property. 3 Acquisition or Refinance of Existing Occupied Apartments: 223(f) Page 3 of 5 INTEREST RATE Interest rates are fixed rate, level-pay for the life of the loan, and are set at the time the loan is purchased by the investor. The loan will be purchased after HUD issues a Firm Commitment and before Endorsement. Prepayment penalties and discounts vary depending on market conditions. The lowest interest rate is associated with a lock-out for the first two years and declining penalties for the next 8 years to none after year 10. SECONDARY FINANCING All second debt must be fully subordinated to the HUD-insured loan, repaid solely from 75% of surplus cash, and the term must equal or exceed that of the HUD insured loan. Public secondary debt from federal, state, or local agencies is permitted in any amount and may be secured by the property. Private secondary debt is allowed only if the sum of the HUD-insured first mortgage and the second debt is less than 92.5% of the value of the property, and must be unsecured. UNDERWRITING PROCESS AGM will prepare a preliminary mortgage calculation. If this calculation indicates that the project qualifies for a HUD-insured loan acceptable to the borrower, AGM will schedule a site visit with the Borrower and informally discuss the project with the local office of HUD. The formal application is made in two stages. 1. Concept Meeting: AGM will prepare a brief synopsis of the transaction for HUD followed by a meeting with HUD, AGM, and the Borrower. The meeting gives the Borrower an opportunity to discuss significant issues and HUD s pipeline. HUD will decide whether or not to accept an application. 2. Firm Commitment Application: The Borrower is given 120 days plus three 30-day extensions for good cause to file a Firm Commitment Application. This application includes an appraisal, Phase I, Form HUD-4128 (further environmental investigation), a property capital needs assessment, management documentation, and all mortgage credit documents. Projects with units or loans of $20M - $50M will be reviewed by a Hub loan committee and larger projects will be reviewed by the National loan committee. HUD will issue a Firm Commitment or reject the application. 5 Acquisition or Refinance of Existing Occupied Apartments: 223(f) Page 5 of 5 OTHER PROGRAM FEATURES MAP processing requires a 3 rd party appraisal, environmental, and a Property Capital Needs Assessment (PCNA) at your expense. AGM completes REO analysis, mortgage credit, and management review. Rents and expenses must be comparable to the marketplace. Davis-Bacon (prevailing) wages are not applicable. A short form of cost certification must be completed after repairs are completed. A detailed work write-up for repair items is required, listing quantities and unit prices. Equal employment and equal housing opportunity requirements apply. Modified environmental review for conditions associated with noise, flood plains or wetlands, historic location, toxic wastes, lead-based paint, and asbestos. Maximum residential occupancy for underwriting is 93% or 95% for projects with 90%+ Rental Assistance (Section 8) for debt service mortgage calculations The Appraisal used for LTV calculations is based on market rents, vacancy & expenses. HUD will require an initial deposit to Replacement Reserves which can be financed with mortgage proceeds. Underwriting of commercial space is different from residential, see HUD Mortgagee Letter for details. Refinance of HUD Section 202 projects is subject to extensive requirements outlined in several Notices: , , and Please contact AGM for details. Although the loan is non-recourse, an individual and an entity with the appropriate financial capacity are required to sign a section of the Regulatory Agreement addressing the non-recourse carve-outs identified as Section 50. The provisions of this paragraph do not alter the non-recourse nature of the loan but do require the signatories to accept personal liability for certain improper acts (fraud, theft of funds, unapproved transfer) which they personally committed or the misuse of project funds they authorized or received. 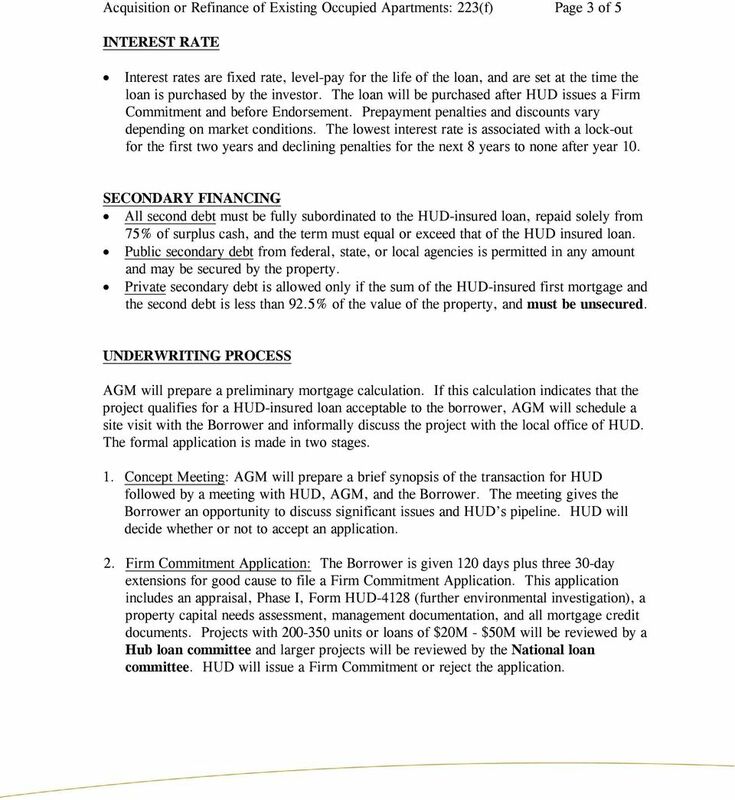 For more detailed information, please contact AGM and see the Regulatory Agreement posted on HUD s website (HUD Form 92466M); we have also posted a HUD Non-Recourse Policy Description on our website, AGMFinancial.com. 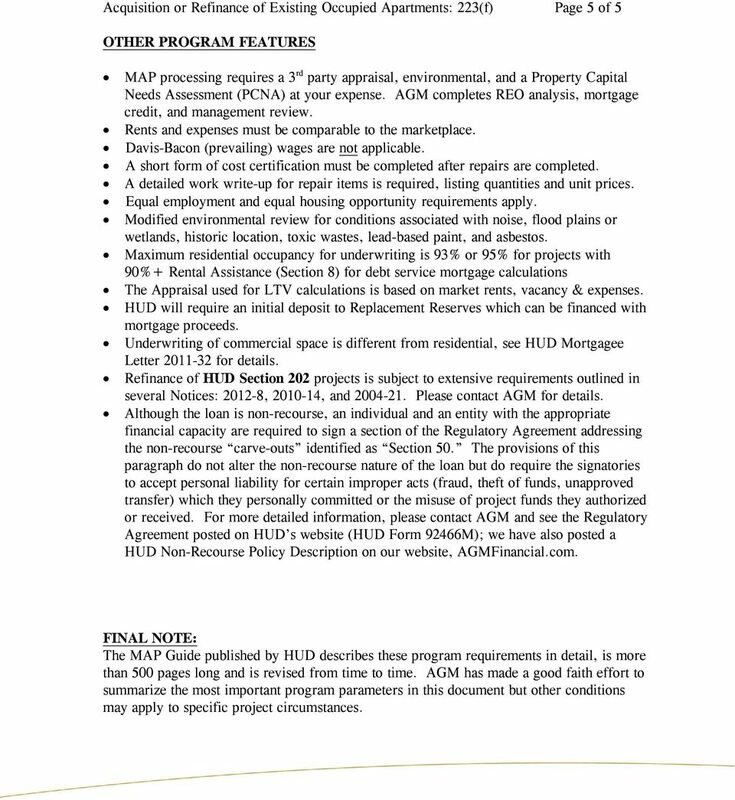 FINAL NOTE: The MAP Guide published by HUD describes these program requirements in detail, is more than 500 pages long and is revised from time to time. AGM has made a good faith effort to summarize the most important program parameters in this document but other conditions may apply to specific project circumstances. Quick Reference Program Summary. 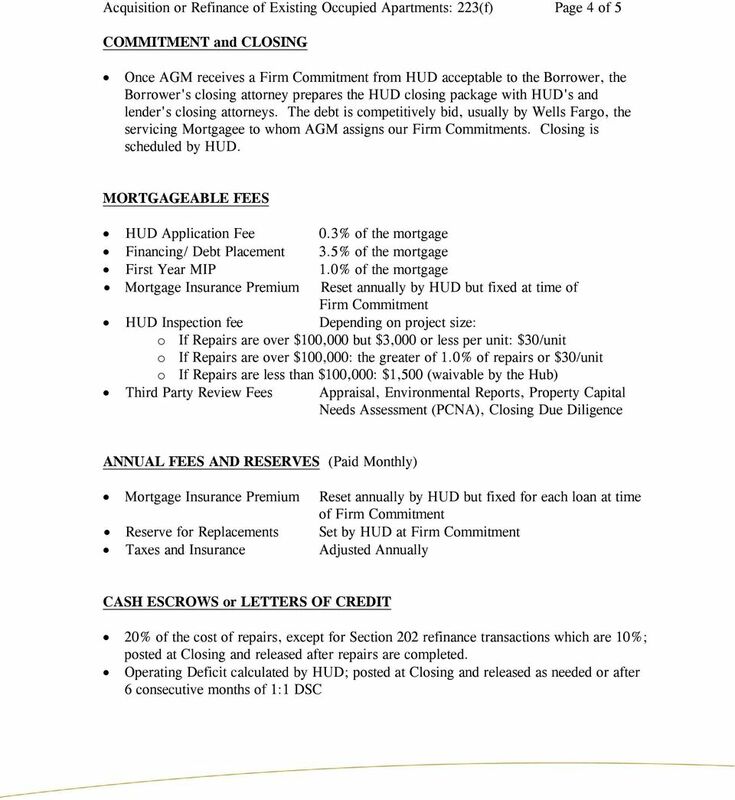 The following is an outline of the underwriting and closing requirements of New Hampshire Housing. REQUEST FOR PROPOSAL for REFINANCE OF FIRST MORTGAGE FOR FOOTHILLS COMMUNITY for BOULDER HOUSING PARTNERS June 24, 2013 Requested Return: July 12, 2013 Boulder Housing Partners 4800 Broadway Boulder, Co. NOTE: This matrix includes overlays, which may be more restrictive than FHA requirements. A thorough reading of this matrix is recommended. administered by the Office of Healthcare Programs. Numbers. on Case. Case numbers can MIP): Premium. April 18, 20111 REFINANCES. LTV Ratio >95 95 1.15% 1.10% 1.0. LTV Ratio >90 90 .50%. What s s New With FHA? PRIMING THE PUMP: PROGRAMS TO ENCOURAGE LENDERS TO LEND. By: Sheelagh Allston, Esq. EXPLANATORY NOTES TO SCHEDULE 10-B: ESTIMATED DEVELOPMENT COSTS AND CAPITAL REQUIREMENTS. 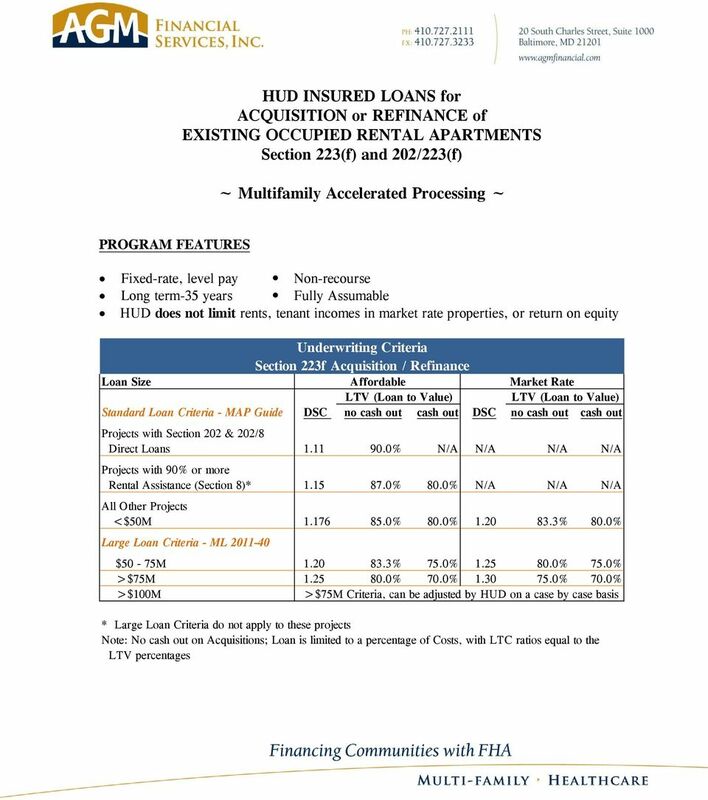 The following breaks down the Loan Estimate by section with examples from Encompass followed by official commentary. 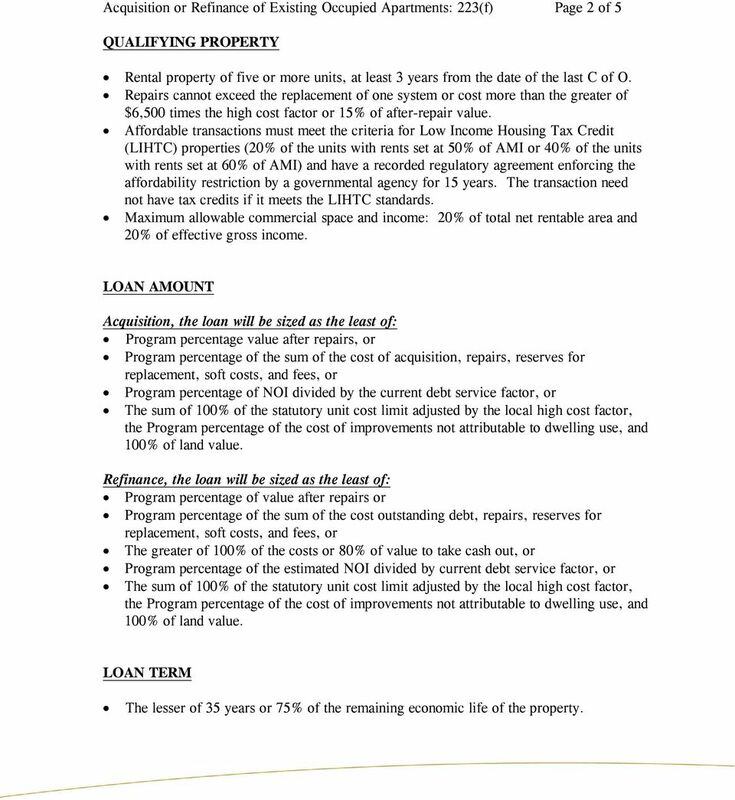 Also attached, is a copy of a completed Loan Estimate form provided by the Encompass..